Many drummers want to start out by immediately throwing themselves onto a drum kit and learning grooves. While it is fun to immerse oneself in a big undertaking, doing so can stunt one’s musical growth. Focusing on one aspect of a time in drumming, and music in general, will ensure that you are learning what is necessary to move on. Overlooking basic form and function can impede one’s ability to progress and master many high-profile techniques down the road. Practice pads are a great way to track one’s progress and form without all the hassle of moving around a kit, or even making noise. 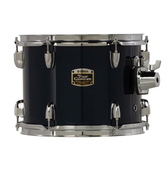 While some drum instructors will suggest a drummer purchase a student’s snare drum, others believe that student snare drums fall far short of something a young drummer should purchase to use for a long period of time. Practice pads are an inexpensive alternative to a student snare drum, and are much more compact, durable, and quiet. Practice pads by Remo are popular and highly rated because they can be tuned like a drum to adjust their ‘rebound,’ or bounce, to sound and feel different. Vic Firth makes practice pads out of both rubber and plastic that encourage both accuracy and consistency of one’s strokes. The hard plastic side of the pad actually impedes one’s strokes so it forces you to play properly to adjust to the difficulty of the pad. It’s effective; you feel as though you’ve improved in speed and control upon switching to the more natural-feeling rubber practice pad. There is no official time when a player should make a transition from a practice pad to the official thing, and even then the drummer shouldn’t abandon the pad, as they prove to be immensely helpful at all skill levels. Your teacher will be able to judge when you have reached the appropriate skill level to allow you to undertake the challenge of playing the full drum kit. The largest drum, known as the bass drum, has the lowest pitch of the drum kit and is most often used to keep the beat. These can be held up in the air by a cradle-type stand and struck with mallets, as in classical or orchestral music; carried by drummers on their chests, as in marching bands; or placed on the floor and struck by a mallet (also called a beater) affixed to a foot-operated pedal called a bass drum pedal, as with a full drum kit. Sometimes the bass drums used in drum kits are called kick drums, called so because of their foot-operated nature. Some drummers choose to use multiple bass drums in their setups, allowing bass drum use with both feet. Although the style was first invented by a jazz drummer named Louie Bellson in the 1950s, it has more recently become associated with heavy metal and more technically challenging musics. Mastering the art of double bass drumming is very helpful in learning complete limb independence and coordination, and can make for some very interesting beats. Drummers who want to play double bass but do not want to or can not use two bass drums can use what is called a double bass pedal, which is essentially two bass drum pedals attached together that allow comfortable playing on one bass drum. Without a doubt, the most important and musically pertinent drum in history has to be the snare drum, so called because of the wires that are attached to the bottom (resonant) head of the drum, which snap when the top (batter) head is struck. These snare wires, or snares, are what vibrate against the resonant head and give the drum its classic, ‘snappy’ sound. Snare drums were originally created to be used by marching drummers in the military, who wore them slung over their shoulder and marched into battle whilst playing them. Modern marching band drummers still wear their snare drums while playing them, but now use more sophisticated mounts and play in much more technical ways. Placed in the center of the drum kit, the snare drum is the focal point of the modern drummer’s sound. Snare drums are a drummer’s voice and are sometimes built of different materials than the rest of one’s kit, to achieve the desired sound. Snare drums are built very differently based on the style of music being played, varying in shell type, shell diameter and depth, shell thickness and tuning. It is because of these varying sounds that some drummers may have multiple snare drums at their disposal when playing, or even set up in their kit to access these sounds on the fly. 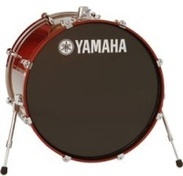 The other drums that you see in a common drum kit are known as tom-toms, or just toms. They range in diameter from 8” to 18”, most commonly, and can be in a wide variety of depths. Toms can be either single-headed or double-headed, and are generally tuned to specific pitches to provide the drummer with a series of notes and sounds to choose from. The number of toms vary from person to person and genre to genre, but there are no rules in what you can use in what situation, or anything like that. The largest drum, known as the bass drum, has the lowest pitch of the drum kit and is most often used to keep the beat. These can be held up in the air by a cradle-type stand and struck with mallets, as in classical or orchestral music; carried by drummers on their chests, as in marching bands; or placed on the floor and struck by a mallet (also called a beater) affixed to a foot-operated pedal called a bass drum pedal, as with a full drum kit. Sometimes the bass drums used in drum kits are called kick drums, called so because of their foot-operated nature. ‘Drum heads,’ sometimes seen spelled ‘drumheads,’ or just ‘heads,’ are the plastic “skins” that are stretched over the shell of a drum. Originally, drummers used animal skin for drum heads, but after plastics and synthetic, man-made materials were available, the drum head was no longer made of animal hide. The modern drum heads are usually crafted of one or more sheets of a plastic sheeting known as mylar, a common item used in many other trades. When stretched, drum heads obtain a certain pitch and sound. Just like with guitar strings, the tighter they are stretched, the higher their pitch becomes. Drum heads are held on to the drum by a metal ring called a hoop, which is secured to the drum by a series of screws called tension rods. When these tension rods are screwed into the shell’s attached hardware called lugs, the hoop is pulled downward onto the head, which is then stretched. This is the basic idea behind tuning a drum. Of course there are many other factors that go into tuning a drum, which will be covered far more in-depth in videos dedicated to these methods. ‘Drum sticks’, sometimes spelled ‘drumsticks,’ are just what they sound like. They are wooden sticks of various lengths, thicknesses and types that allow you to interact with your drums and cymbals in various ways. The most common kind of drum stick is made of hickory, a type of wood. Sticks can also be made of different woods, such as oak, birch, or maple, or even metals like aluminum. Most standard drum sticks have either wooden or nylon (plastic) tips, which produce different sounds. Different styles of drumming call for different kinds of sticks, but more often than not it’s up to the drummer to decide what stick works best for them. There are ‘junior’ sticks for younger drummers with small hands, but for drummers age 8 and up, generally, standard drum sticks work just fine. The best way to find the right pair of sticks for you is to try a whole bunch of them out! Your teacher is also bound to be very knowledgeable about these things and can certainly help you find the pair that fits you just right. While there are hundreds of different kinds of sticks, some of them even custom-made for professional drummers, the four most popularly made models available from most stick companies are as follow. 7A : Thin sticks, short in length and lightweight. Most used for jazz music and lower-volume situations. Low durability, but fast. 5A: The ‘standard’ size; preferred by many drummers. Very versatile and comfortable to use in many playing situations. Medium durability. 5B: Thicker and heavier than a 5A. Many drummers who like heavy styles of music use these. Many orchestral drummers use these on the kit. 2B: Very thick. Young drummers like them because they’re easy to hold but can create problems in technique and can cause learning drummers to ignore proper posture and form. Heavy and slow. 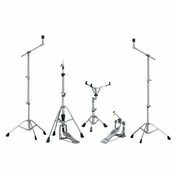 Drum kits are generally held together by metal stands called ‘hardware’, which have varying types as well. There are tom stands to hold the toms, snare stands to hold up the snares, bass drum pedals, cymbal stands of many different kinds, and the drummer’s stool (which is officially called a throne). Sometimes, instead of individual stands a drummer will elect to use a full-size “rack” system that allows widely independent setup options with nearly unlimited variability. The kind of hardware you need depends on the kind of drum kit you are using, and your setup preferences as well. Alongside the drums in a standard drum kit are metal discs called cymbals. Commonly misspelled ‘symbols’, ‘cymbols’, or even ‘symbals’, these can be made of many different kinds of metal. Most commonly, they are made of bronze alloys, which generally consist of brass, copper, tin, and sometimes even silver. These cymbals can either be created in sheets and ‘punched’ into form by large machines. More often than not, these are the lowest-quality cymbals that companies will offer as ‘beginner cymbals’ as these are the least expensive cymbals to make. Higher quality cymbals are ‘cast’, which means that the cymbal makers will melt down all the metals that make up the cymbal, and pour them into a mold to cool in the shape that they want. Then, the makers will take the raw cymbal and put it on a spinning machine called a lathe and cut off the excess material and smooth the cymbal down. Depending on the brand, cymbal makers will either hammer the cymbals by hand, use a hammering machine or leave them lathed and ‘raw’. From there, they will usually polish the cymbal to a natural brass color or a ‘brilliant,’ mirror-like finish. The hole, which allows you to mount it on a stand, then the ‘bell’, which surrounds the hole and produces the highest pitch you will find on a cymbal; striking the cymbal here will usually not make a huge sound as it doesn’t cause the cymbal to vibrate much. The ‘bow’, the middle part--this produces a slightly lower pitch than the bell and is usually the best place to strike the cymbal when using one for beats and grooves as it is usually very consistent in sound; striking a cymbal repeatedly on the bow will cause the sound to increase and grow in volume until the entire cymbal is vibrating and making a lot of noise. The outermost part of the cymbal is called the ‘flange,’ which in drum speak can mean ‘bend’, because the cymbal is usually bent to accommodate being struck by a drumstick. Striking the flange in an inappropriate manner with too much force can damage or even crack the cymbal, rendering it useless, and sometimes it’s not the drummer’s fault but rather how the cymbal is positioned. Many young or uninformed drummers make the mistake of keeping their cymbals placed high above their normal reach and parallel to the ground. While it looks very theatrical and cool to have to reach up that high to hit a cymbal, it is very cumbersome and hard on one’s cymbals. Generally speaking, the larger the cymbal, the deeper its pitch; the smaller the cymbal, the higher its pitch. Heavier cymbals produce sound for longer amounts of time and are generally louder in volume, whereas lower-weighted cymbals produce sound for smaller amounts of time and are generally quieter in volume. The length of time a cymbal takes to become silent after being struck is called its ‘decay,’ and is classified in length, as in ‘short decay’ or ‘long decay’. There are many other terms that help to classify cymbals and their sonic characteristics, such as: dry, dark, warm, bright, cut, breath, attack, punch, depth, ring, and more. 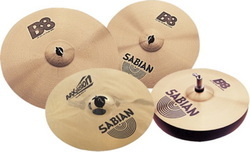 There are MANY different kinds of cymbals, but there are a select few that you’d use on a modern drum kit. You can achieve a wide variety of sounds from your cymbals based on the strength, speed, angle, and direction of your strike. Differences in cymbal creation also greatly vary the sound produced by your cymbals, as well as what type of stick, brush, or mallet you use to hit it. Another variable with cymbals is the location on the cymbal of where it is hit. Different locations create different sounds even when struck with the same part of your stick, whether it is struck on the flange, the bow, or the bell of the cymbal. Sometimes cymbals are made in such a way that the bell, bow, and/or flange can sound completely different on the same cymbal. The most-used cymbal on the modern drum kit is actually a set of two cymbals, called the hi-hats, held in a clam-shell shape. These are set on a hi-hat stand, which is operated by a foot pedal that allows the two cymbals to open and close depending on how much you depress the pedal. These are some of the most expressive instruments you can ever use, as you can use them to communicate more than other cymbals, which provide a bit less control. You can use them open (cymbals apart) for more driving rhythms, or closed (cymbals together) for tighter patterns or lower-volume situations. Some hihats are ‘vented,’ which means that there are a few holes drilled into the bottom hat, which prevents airlock and helps keep the sound crisp and consistent. Most hihats hold diameters between 13” and 14” but drummers elect to use other sizes, even as small as 8” and as large as 22”, depending on the person and musical situation. Another common cymbal used on the modern drum kit is the crash cymbal. These come in all sizes and kinds that vary greatly between styles and genres of music. Some crash cymbals are used in marching band and are usually pairs of large cymbals that the user will ‘clap’ together to create a crashing sound. Crash cymbals are generally used to signify change in a song, or to create the feeling of intensity. Depending on the style of music, a drummer may use as little as zero or as many as, say, ten crash cymbals on their kit. Some jazz drummers choose to not use crash cymbals at all and instead use only hihats (described above) and rides (see below). Some heavy metal drummers will use crash cymbals for everything including their hihats (by pairing two crashes together) and rides. Crash cymbals are often the most frequently damaged cymbals as they take force to create consistent sound and many young or ignorant drummers don’t take the time to ensure the cymbals are properly mounted and safely secured, not to mention properly played. Another staple of the drum kit is generally the largest cymbal on a typical kit; this is called the ride cymbal, or just ‘ride.’ This cymbal is also quite expressive in that it produces very different sounds based on where it is struck. Rides are generally pretty heavy in terms of actual weight, and it is because of this that they vibrate quite a lot; this causes them to ‘ring’, which is why some drummers elect to dampen them with different things to get a more consistent sound out of them. Most ride cymbals are generally struck on the bow for most beats or grooves, which yields a nice consistency in sound and control in volume and sticking. The bells on ride cymbals are also made in such a way that they really stand out from the music and produce that classic ‘ding’ sound that really cuts through the music. Ride cymbals can also be ‘crashed’, meaning struck on the flange as if it were a crash cymbal, to either be substituted as an additional crash cymbal or struck as an effectual sound in a groove, fill, or beat. Other cymbals are usually categorized into the group “effects cymbals.” Two examples of these are ‘splash’ cymbals, and ‘Chinese’ or simply ‘China’ cymbals. Splashes are like miniature crash cymbals, and just like the name implies splash cymbals are not as intense-sounding as their larger counterparts. Most splashes are between 6” and 12” in diameter. Some are meant to be strictly splashes, and some are meant to mimic the sound of a larger crash cymbal with similar characteristics. Splashes are generally used to add ‘flavor’ to a groove without too much volume, or in a situation where a crash would be too loud. An example of this would be a hard rock song with a soft, classical guitar section in the middle of the song; to avoid overpowering the rest of the band in the softer section, the drummer may accent his playing with a splash hit instead of a crash hit. Because of their small size, splashes have a very high pitch to them and are usually much thinner than other cymbals. 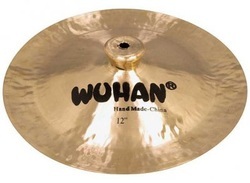 The ‘China’, or ‘Chinese’ cymbal mentioned above is named so because of its classic “Oriental” sound. They also have a large physical difference. The bell and bow on a China are the same as a crash, but the flange is bent upwards and the China is usually mounted upside-down and struck on the underside of the flange to help prevent cracking. Chinas are raw-sounding and loud, and very explosive in nature. They are typically not used as a drummer’s main accenting cymbal, but rather in addition to crash cymbals and others, as they are very single-toned and abrasive and not meant for all situations.